OK, so I know that this week’s recipe was supposed to be sweet potato biscuits, but I have a thing for pumpkin so I changed it up a little. This recipe was chosen by Erin of Prudence Pennywise. I notice that her biscuits are light and fluffy looking, unlike mine which are neither, light nor fluffy. That being said mine were super tasty. I used a cup of canned pumpkin and I added an extra tablespoon of brown sugar (’cause I like sweetness!). Obviously, I need to work these to get to the light and fluffy place but all in all there were super tasty. Hmm, pumpkin. Strawberry season is a personal favorite of mine. To me it symbolizes the start of summer and I really dig that delicious fruit. I thought I was going to miss this year’s season as I was in Kenya with my da. But given the lack of heat that we have been experiencing in Ontario, strawberry season was delayed (whoohoo). I went strawberry picking on Canada Day (what could be more patriotic that picking red fruit on Canada Day?) with friends. I ended up making three different types of jam after realizing I still had TONS of last year’s berries in my freezer. Despite the jam escapades I still had some strawbs left and I went searching for a recipe. 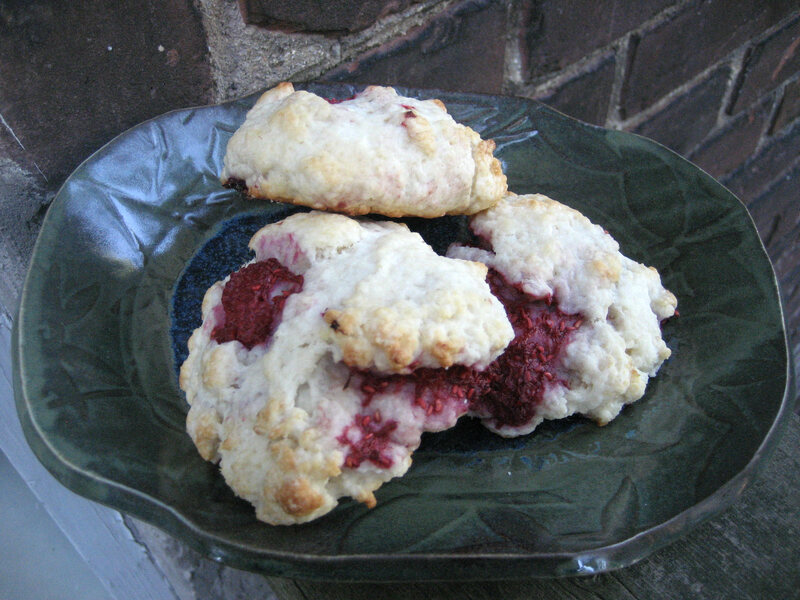 I went through my delicious tags and I found a recipe for strawberry scones over at Confessions of a Tart. I LOVE scones and since I came back to Canada by way of Ireland (where I ate my fair share), I was in a scone mood. This is how they turned out. I guess since I had just eaten Irish scones my expectations were a little high. I thought they were okay, not enough sugar for my taste buds but once I put my fresh strawberry jam on them they were pretty darn tasty. The coworkers gave them the thumbs up, but then again, they will eat anything;) I think next time I will try adding strawberries to my momma’s scone recipe. For the recipe and more artistic photos head on over here.